Description：Please be notified that as approved by the Ministry of Transport of PRC, China Classification Society (CCS) has adjusted the main responsibilities of the Departments and the organizational structure of its Headquarters. Please be notified that as approved by the Ministry of Transport of PRC, China Classification Society (CCS) has adjusted the main responsibilities of the Departments and the organizational structure of its Headquarters. The new structure begins to operate from 0:00 March 25, 2019. Administration Office/HongKong-Macao-Taiwan Affairs Office, Party Office/Trade Unions Office, Discipline Supervision Department, Finance & Auditing Department, Human Resources Department, Safety and Quality Department, Business Development Department, Technology & Information Department, International Affairs Department, Newbuildings Department, Classed Ship in Service Department, Domestic Ship in Service Department, Special Ship Department, Marine Product Department, Offshore Engineering Department, Fishing Vessel Department. With 3 directly affiliated bodies：Technology Research & Development Center, Information Center, Science & Technology Innovation and Test Center. 1.Administration Office/HongKong-Macao-Taiwan Affairs Office: general administrative affairs, legal affairs, letters and visits, poverty alleviation, public relations, HongKong-Macao-Taiwan affairs management. 2.Party Office/Trade Unions Office: party building, united front related work, trade unions and mass work. 3.Discipline Supervision Department: party discipline inspection and administrative supervision, inspection work of the whole system. 4.Finance & Auditing Department: financial affairs management, internal audit, management of investment, fixed asset and infrastructure construction. 5.Human Resources Department: management of organizational structure, management of staff and cadres, human resource related work. 6.Safety and Quality Department: safe production management, building and control of quality, environment and occupational health and safety, management of suppliers. 7.Business Development Department: business strategy planning, development policy, brand-building, promotion management and market development, new business planning. 8.Technology & Information Department: technology and information development planning, management of technology and information projects, development of system of rules and standards, IMO and ILO technical affairs. 9. International Affairs Department: technical and general affairs related to IACS, ACS, non-governmental organizations, EU and flag States, bilateral international cooperation and exchange. 10.Newbuildings Department: survey of newbuildings, ship plan approval management. 11.Classed Ship in Service Department: in-service survey of classed ships (including major conversion), audit and certification management, import inspection and technical assessment of ships, management of delegation of survey of ships. 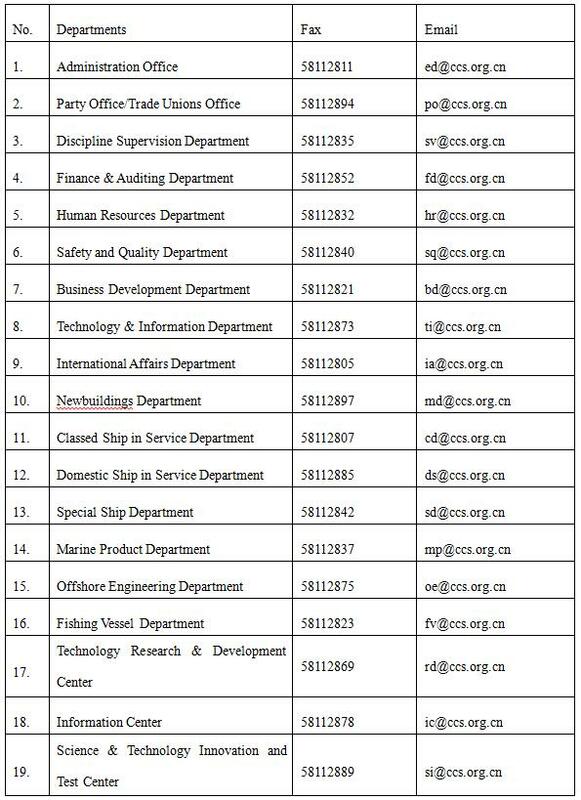 12.Domestic Ship in Service Department: survey of ships engaged in domestic navigation (including major conversions), management of audit and certification of these ships. 13.Special Ship Department: business planning for special ships, plan approval, construction, operation of special ships, management of marine products used onboard special ships. 14.Marine Product Department: field inspection of marine products and plan approval management. 15.Offshore Engineering Department: field inspection of offshore installations and plan approval management. 16.Fishing Vessel Department: management of plan approval, construction and in-service survey of overseas fishing vessels, management of delegation of survey of ships. 17.Technology Research & Development Center: technical research relating to CSR, development and maintenance of major software system for ships. 18.Information Center: planning of information technology application, planning and implementation of cyber security measures, building of unified data and resource platform, building and maintenance of information infrastructure. 19.Science & Technology Innovation and Test Center: planning for the development of scientific innovation and test and verification capability, development of ship intelligence technology, green ecological technology and new survey technology, development of test and verification and technical service products. -3- Contact means of the Departments under the Headquarters. -4- Declaration on change of the official stamps of related Departments. Since 0:00 on March 25, 2019 (Beijing Time), the Departments with new names start to use new official stamps.